Press Kit - MichaelvanKrueckers Webseite! Biography / Short Biography / Photos as a PDF file and jpeg standard that you can print and save. You will need Acrobat Reader to open the PDF file. 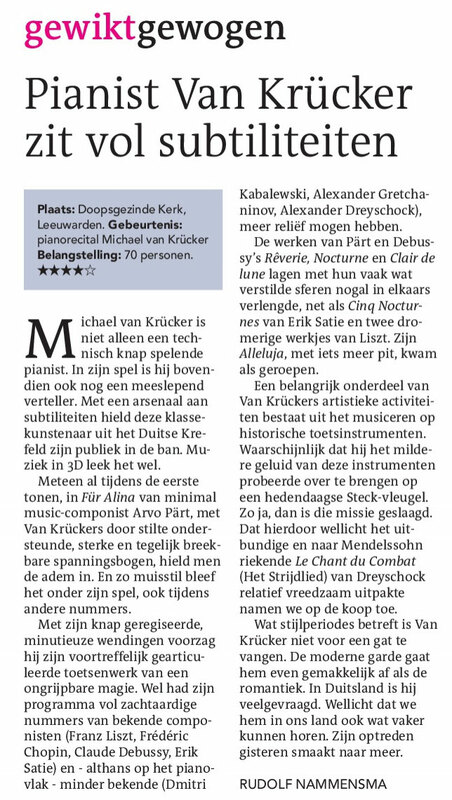 "... it was fun to listen to..."
"… van Krücker's experience with historic pianos shows in his sensitive use of touch, dynamics, and tone colour, being expressive without being as excessive as most of his colleagues performing music from the late 19th century. Sound is powerful, with wide dynamics, the piano sounds direct and powerful without being removed too far from the listener. Musically, his playing leaves nothing to be desired." "The well-known pianist plays Nietzsche's compositions for solo piano most excellently in a best-quality SACD recording for NCA (New Classical Adventure). 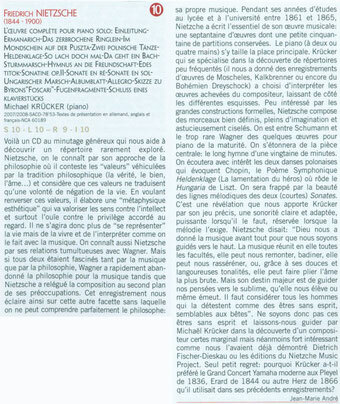 Van Krücker's sensitive interpretation together with his outstanding technique bring Nietzsche's music to life and open the listener's ear and mind to Nietzsche's musical statements in these mostly short compositions. This SACD can only be recommended to all those interested in Nietzsche and his music. It is fortunate for Nietzsche and for his fans that Michael van Krücker is there to forge this acquaintance. "... brilliant pianist van Michael van Krücker plays Kalkbrenner's oeuvre on a Pleyel dating from 1836. The Pleyel is warm and ample in the bass, sparkling in the descant, with a dry, percussive touch in parts. Its breadth is overlaid by a fine, restrained effervescence of overtones, in excellent harmony with the poised hovering of Kalbrenner's music. ... Discoveries that I can unreservedly recommend." "The main work presented on this record, however, is the piano sonata op. 48 in a minor, dedicated to Cherubini. This is a marvellous piece starting with an impressive allegro moderato and finishing with a fiery agitato assai. Like the rest of the selections on this CD it is very well played. Michael van Krücker deserves the highest praise for having found these manuscripts..."
... is an excellent Moscheles interpreter." Van Krücker brings us a revelation through his precise playing, through his clear and sensitive sonority, powerful when necessary, restrained when the melody requires it. In his new album with Nietzsche's "Complete Works for Piano Solo", Michael van Krücker interprets the ideal of an orchestra in a mellow, rounded and clear tone. These themes, under Michael van Krücker's touch, unfold a calm in a world of chaos for us to experience and enjoy. The artist plays with fervour and a deep poignancy, just as Friedrich Nietzsche intended. "Michael van Krücker presents the charming character pieces in an exceedingly attractive form, with period authenticity an added bonus thanks to the use of a Herz pianoforte dating from 1866. 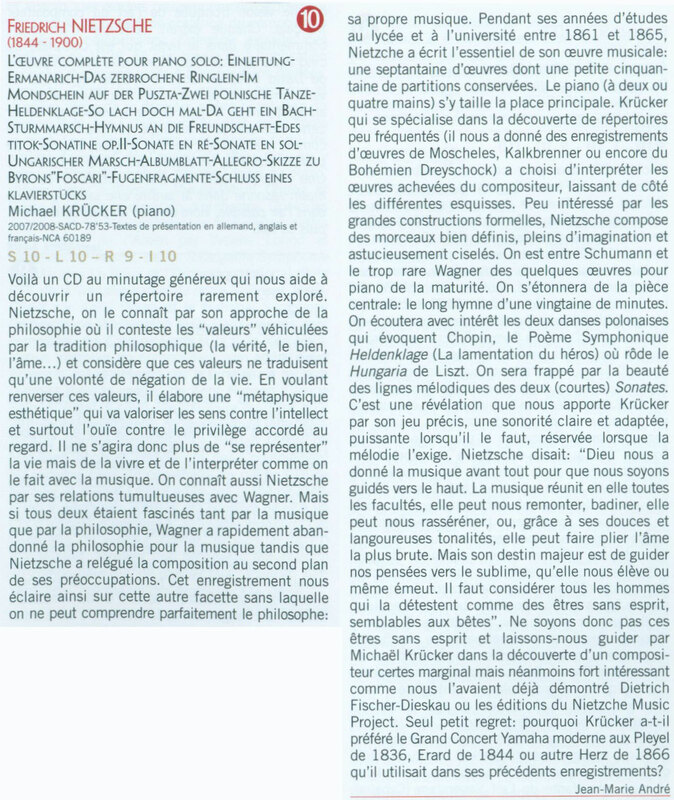 "Michael van Krücker demonstrates a very good rapport with this music and the technical mastery required to make it all interesting..."
The emotionality is expressed with sensitivity, and the liveliness of the interpretation is a delight to listen to. ... played with musical bravura, the dynamic presentation is combined with fine differences of touch in a wealth of nuances. The homogeneousness and precisely attuned coordination are impressive and characteristic of the outstanding musical and technical stature…"
"... interpret with great enthusiasm..., ... excellently recorded program." "... every piece is performed vivaciously, elegantly and with musical brilliance." ... he displays an attractive "instinct" for subjective avowals, for formally and harmonically appealing inspiration. 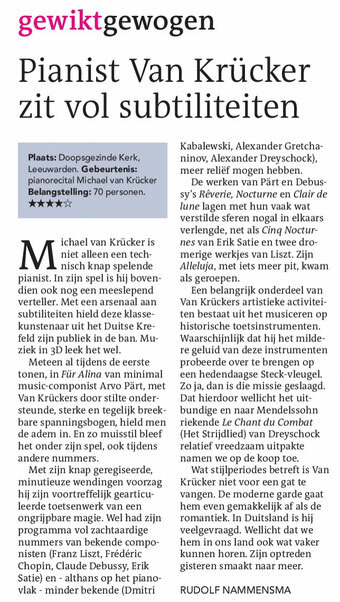 Van Krücker thus shows a true appreciation of the album pieces and micro-sonatas.